We want to personally invite you to watch Monday's Cool2Craft TV with us! 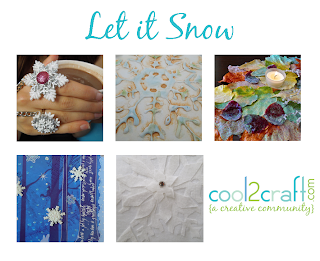 Cool2Craft TV November 19, 2012: Let it Snow! The Cool2Craft girls are sharing snow inspired projects. Tiffany is creating this look of embossing Snowflake Box featuring Aleene's Tacky Glue and Heidi is crafting a No-Sew Snowflake Applique T-Shirt with Aleene's Fabric Fusion Peel & Stick Sheets. Plus we'll be sharing a door hanger, snowflake rings and a snowy leaf tabletopper. Learn new techniques, chat with us while watching the show and ask questions about all your favorite Aleene's products! Drop by our chat room during Monday's show and mention that you saw this post on the iLovetoCreate blog for your chance to win Aleene's Tacky Glue! Airing Monday November 19, 2012 9am Pacific/11 am Central/Noon Eastern. Go to Cool2Craft.com and you'll see the link to the Livestream player and chat box where you can join right in. See you Monday! Visit us on Facebook! Get creative! Get inspired! Be cool!